Helmet Mounted electricians carrier and face shield. 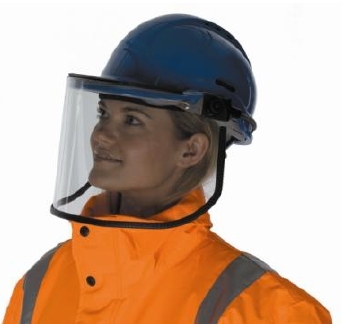 Suitable face protection against short circuit electric arc and liquid splash and either Low or Medium Energy Impact (variant dependant) when attached to a CE certified Safety Helmet. Typically used by electrical workers, linesmen and electricians working with high voltage connections who are sometimes exposed to the sudden release of energy that occurs during an electrical arc. This explosive condition includes a broad spectrum of electromagnetic energy, plasma, fragments and a spray of molten materials.